Incredible things always happen during an Agora. The AEGEEan checked old material and asked some old members for interesting stories about this issue, a funny way to approach the upcoming Spring Agora Bergamo and read some legends of the past. The Agora can be something legendary for those who have never been there, since they probably heard many stories before departure. For those who already experienced it at least once, it is something incredible: a thousand of people from all over Europe, a huge common commitment, great discussions, fabulous encounters, moments of sharing and great parties. For the people organising it, it is something very different. More than one year ago, I had the honour of being an organiser of Autumn Agora Cagliari. If you ask me to say what it looks like, I would probably say tiring, challenging and agitating. If you ask me why, the answer is easy: anything can happen, even if you planned it in detail. On the 28th of October 2014, a sponsor gave us two cars and a big van. They were quite big and none of us had used a van before. We drove them to pick up CD members at the airport and, after greeting them, we put the luggage inside the last one. Once ready to drive it, an alarm rang showing that the trunk was open, we closed it many times without any result and then we thought it was a van problem. Of course the reality was very different, because as soon as we had entered the highway we heard dozens of horns around us: two bags of our former president Paul Smits broke out in the street forcing uncountable cars to make extraordinary riggings and we had to walk in the middle of the street to take them back. After that moment, many stories I heard about disasters during previous Agorae came to my mind. Maybe you do not know but a lot of weird things happened during our statutory events in the past. Not all the things regarded only organisers or were bad, some of there were actually very positive. But of course at that moment I started thinking about the worst possible scenarios. To start: one of the things to know about the Agora is that it didn’t always look like it does today, at the first ones there were not that many participants. During Agora Salerno 1989, about two or three hundred participants were present and local organisers picked them up at the train station by car! It was the very same Agora during which the Berlin wall fell down and a participant said: “We did not know about the fall of the Wall. There were no mobiles, no one saw the news. I read about it on Monday after the Agora”. In 1994, Agora Montpellier started at a plenary hall but finished on the market square of the French city. Why? According to our source “the freshly re-elected President of AEGEE-Europe, Dorian Selz, did not accept the election result, because he got only 52% of the votes. Before a new candidate could be voted, all the members of the Agora had to leave the building since it was closing time. So they gathered in front of the building and elected the successor, Christina Thorsson, there”. Still, it was not the worst result ever for a presidential candidate. 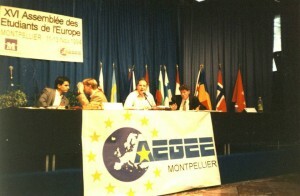 In 1998 Stefan Seidel from AEGEE-Augsburg was elected with a poor 38%. At first he did not want to accept it and said: “I will go home now”. But people convinced him to stay in office. A bad mistake since at the next Agora his CD got a vote of confidence and lost it. 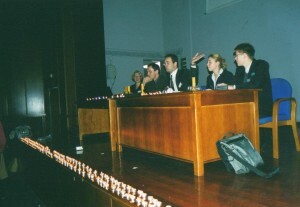 The first day of the Agora in Athina in November 2002 was overshadowed by a blackout. Suddenly the plenary hall went dark. In this case, the reaction was amazing since organisers lightened a couple of hundreds of small candles and gave the Juridical Commission president, Yuriy Tokarsky, a flashlight which he held on the Agora booklet so that President Tomak Helbin could present the CD report. It was accepted with an overwhelming majority. The organisers of autumn Agora Zaragoza in 2003 had bad luck. They could not get the promised location and had to move the Agora to an old fair instead. The participants were sleeping inside that giant hall, when one of them turned on a switch, which he mistook for a light switch. It was the switch for the ventilation and a dead bird, which had ended its life near the ventilator, fell down – right on the sleeping bag of a Dutch participant. The history had a revival in the last years when AEGEE-Zaragoza was chosen as host of the Autumn Agora 2013, some people in fact wondered if participants were going to stay in the same place again: it was not, the event was hosted in a brand new structure used for Expo Zaragoza 2008 and the organisation was simply amazing! If there is a year champion for incredible statutory events, that’s definitely 2006, since in both the Agorae which took place an incredible fact occured. At Agora Warsawa 2006, about twenty couples which found a lonely corner in a garage to spend some nice time with the respective partner: they got registered by a surveillance camera and watched live stream by the guards. As this hi story can be familiar to the readers, not so known is the case of Agora Napoli 2006: in the late afternoon of the 1st of November the water boiler plant of the Fair broke down. It was the All Saint’s day, national holiday in Italy, and the same is the 2nd of November (All Souls’ day). Organisers desperately tried to find a plumber but it resulted in an impossible mission! One of them said: “The only solution to find a plumber in Napoli on the 2nd of November is to look for him at a cemetery”. The situation was not fixed and participants started a huge protest because of cold water in the showers. Lately there have not been such big cases if we exclude huge delays in the agenda, a vote of confidence, some locals which left the plenary for protest, a broken motorbike in Agora Patra 2014 or participants who had to move their luggage because of handball match (they were already informed about it). These can be considered as funny or sad thing things which happened. Except for two cases. Most of us probably remember the 2010 eruptions of Eyjafjallajökull volcano in Iceland, which stopped the flight traffic from the 14th till 23rd of April of the same year. I guess you can imagine what happened: Agora Leiden was taking place from the 15th till 18th of the very same month: the perfect moment to destroy the travel plans of hundreds of AEGEEans, especially for their route back home, and create difficulties for organisers who had to take care of them. If we also consider the CD members as organisers, since AEGEE-Europe is a partner organiser of the Agora, we cannot forget Agora Struga 2011 organised by AEGEE-Skopje. Because of an argue between the CD and local organisers, who increased the event fee one month before the event, for the last days of the event, the organisers disappeared leaving the CD and some other improvised helper managing the whole organisation – starting from the wake up till the welcome pack preparations! It is possible that some organisers of Agora Bergamo or Autumn Agora Chisinau are getting scared while reading this article. In that case we should also remind them that AEGEE has a good God ready to solve every situation…and probably he is a member of AEGEE-Athina. Somehow the Greek local managed to solve not just a difficult situation but even two! 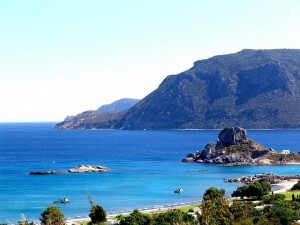 In the far 1992, this local organised an Agora which not took place in Athens but in Kōs, a Dodecanese island in front of the Turkish coast. You may wonder why they wanted to host the event there and the answer is quite easy: Agora was taking place in Spring, in Greece the weather is always nice so let’s gather all the participants in Athens to make a nice boat trip all together! While the organisation was running perfectly, only four days before the event an organiser switched on the TV and saw the sailor’s Labour Union president declaring started an unlimited duration strike because of high taxes. A panic attack caught the Greek organisers which started thinking about all the participants meandering around the Pireaus port and possible solutions to avoid it. One of them, was to meet the same president of the Union Labour – which they did but without results. The second solution, which now can sound very funny but probably in those moments was not, was to get an appointment with the Minister for Foreign Affairs and ask him to talk with the minister for the Defence to get a military vessel and transport all the participants to Kōs. Through some contact they succeeded to get the appointment. At 11 am, two days before the Agora. The minister is taking part in a high level meeting with the Greek PM and the president of the Republic. Organisers are in front of the office ready to meet him, but at 11.05 they see everyone leaving the building and packing their things. They wonder why and they ask one of the officials “Is he coming?” – “No he is not coming at all, he just resigned 5 minutes ago because of disagreements on foreign policies”. In case you wonder how participants reached the location, the story says that the greek minister of Finances (of course pure coincidence) accepted the requests of the labour union the day right before the boat departure. That’s how Agora Kōs could take place. In case you do not believe to this story, you can download the 10th AEGEE anniversary booklet and read about it there (p. 92). Dear future Agora organisers, as you could see, also in the darkest situations there is always light and space for hope, and the people of AEGEE-Athina can confirm it for sure! It has not been an isolated case since we also heard that while spring Agora in Barcelona 1999 was taking place overshadowed by the Nato air strikes against Serbia (with lots of people arriving late, because of many flights cancelled or rerouted), among the participants was Jasna Bogdanovic, President of AEGEE-Novi Sad. She took the opportunity to leave the country and was hosted by the President of AEGEE-Barcelona. They fell in love and got married. So we wish you good luck and may the good God of AEGEE be with you!